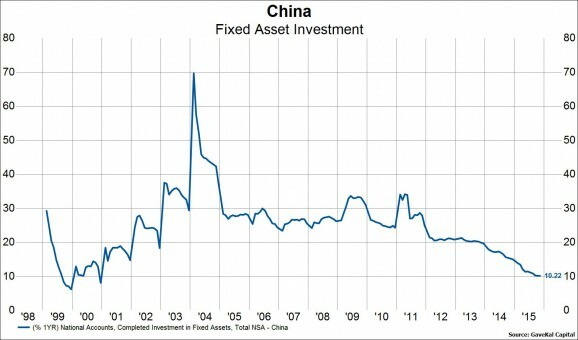 2015 was a year in which many investors were caught off guard by the continued slowing of Chinese growth and the commensurate shocks to the global financial system it created as the renminbi weakened, Chinese foreign exchange reserves declined further, and commodity prices accelerated to the downside. 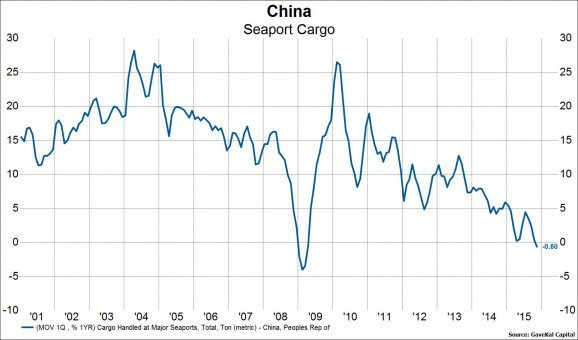 Towards the end of the year, boosted by fiscal stimulus and a stabilization of infrastructure investment, the growth rate of the Chinese economy avoided further slowdown, giving what we believe is a false impression that Chinese growth will remain at a similar level in 2016. 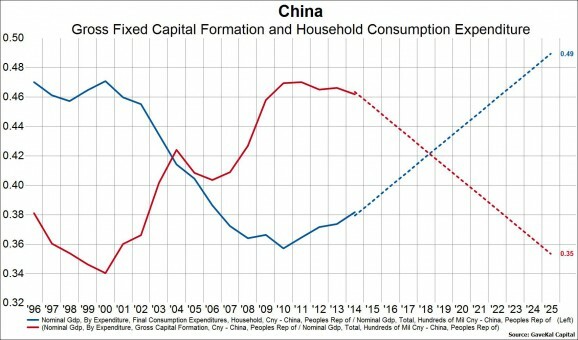 This stabilization was most likely cyclical, and our analysis of the data suggests that China will experience many more years of slowing growth ahead as the rate of infrastructure investment moderates even as consumption growth remains at a relatively healthy level. 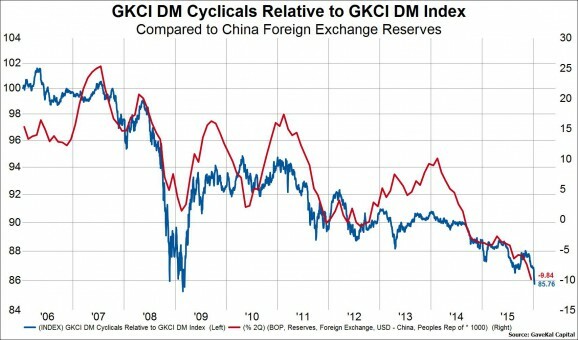 This continued slowing has obvious consequences in the form of further pressure on the renminbi, Chinese foreign exchange reserves, commodity prices and the stocks most affected by these macro variables. 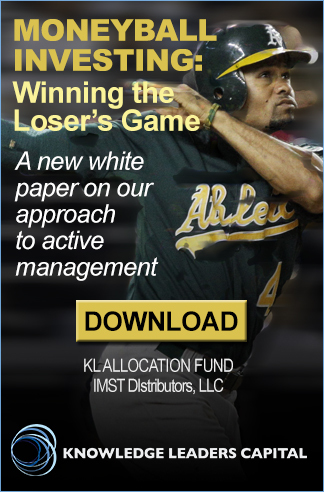 In the below chart book we attempt to efficiently summarize the most important elements at play. 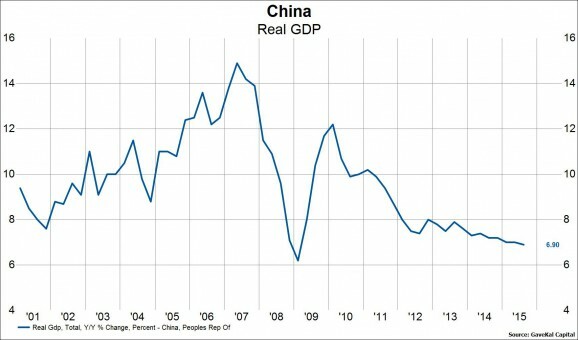 The official Chinese GDP prints have remained in the high 6% range, but other data suggest actual Chinese GDP may be much lower. 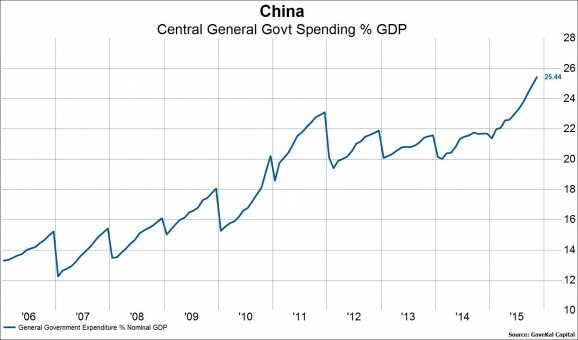 In the second half of 2015 central government spending ramped up fairly significantly as fiscal stimulus was used to offset further declines in the growth rate of the economy. 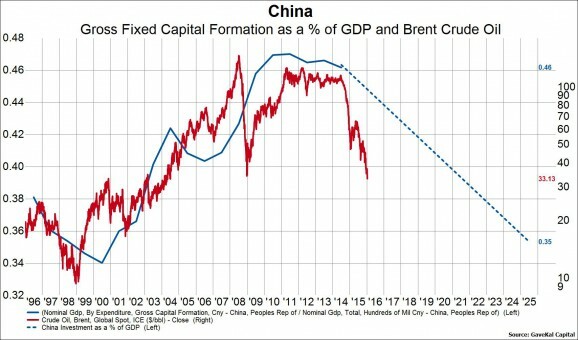 Fiscal stimulus eventually turns into fiscal drag. Survey data were weak throughout 2015 and then stabilized in the 4th quarter. 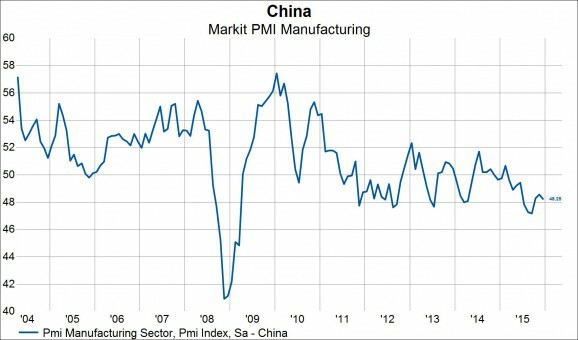 We expect new lows in this indicator as 2016 progresses. 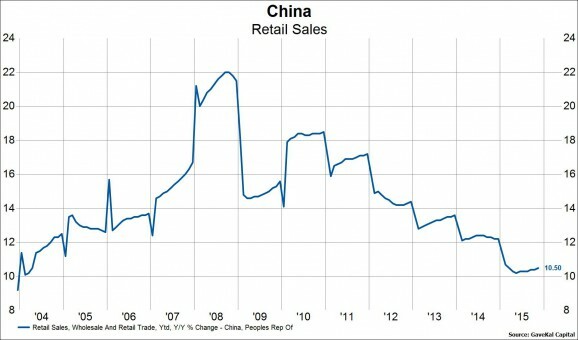 And indicators of consumption will likely remain relatively stronger. 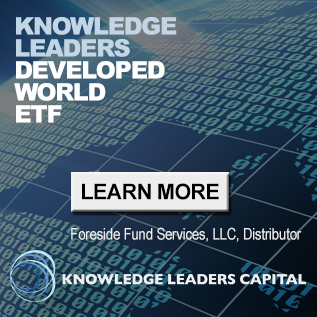 This massive transition has serious and prolonged implications for raw materials prices from copper to crude oil that are likely to be felt throughout 2016. 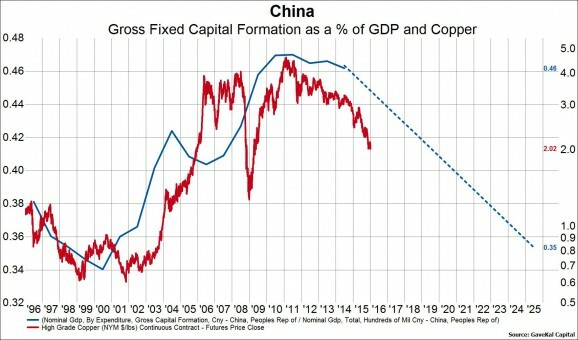 In the charts below the blue line is fixed asset investment as a percent of GDP and the estimated trajectory. 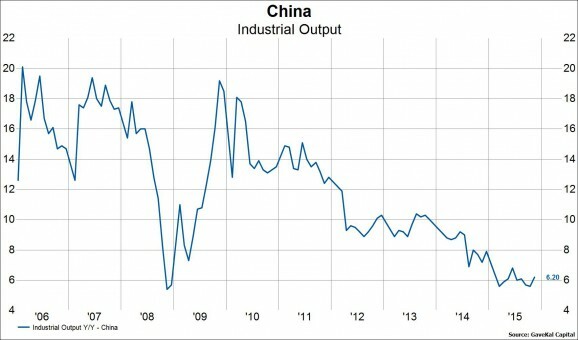 Industrial output saw a stabilization in the second half of 2015, but is likely to see new lows in 2016 as infrastructure investment slows further. 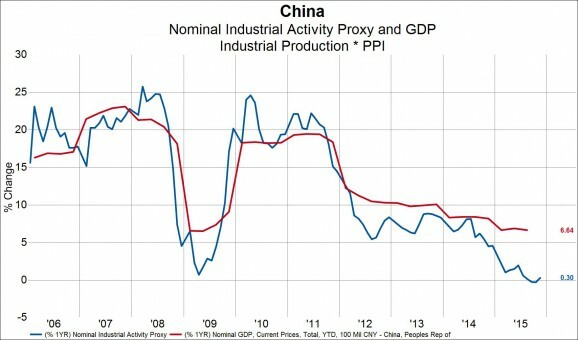 Nominal industrial activity is already at a decade low, with lower levels likely ahead. 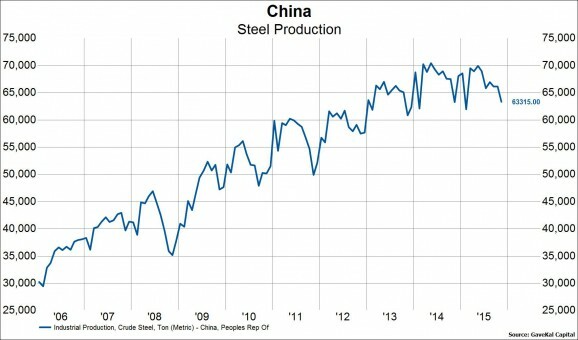 Which fits with steel production completing its elongated topping pattern. 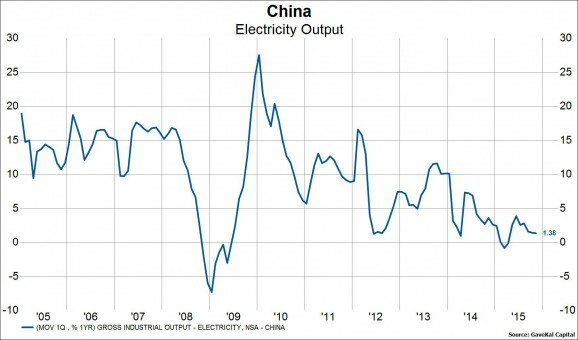 The Chinese economy needs less and less steel as infrastructure investment slows. 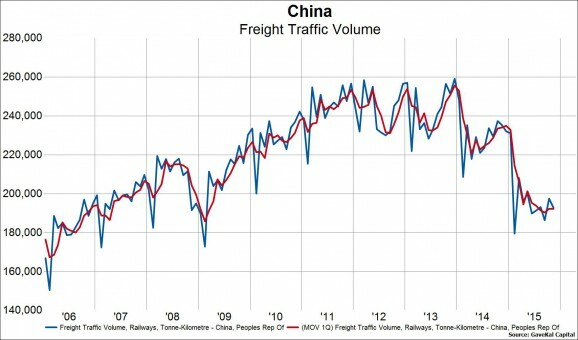 Meanwhile, measures of transportation activity are plunging lower, in line with less need for the movement of raw materials. 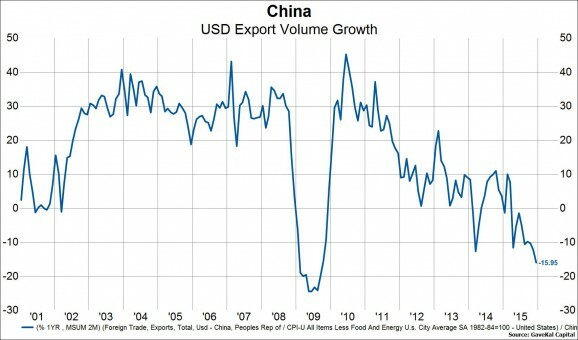 Real exports measured in USD terms are declining at a rate similar to 2009. 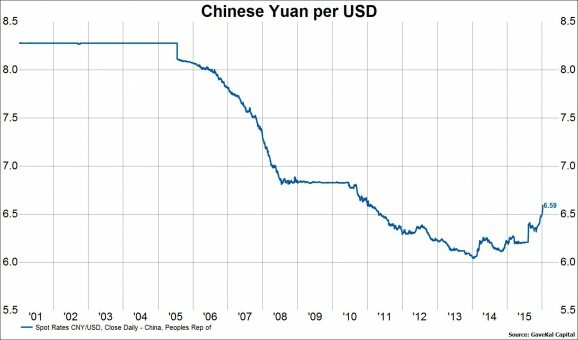 2015 saw substantial weakness in the yuan as the government attempted to stabilize the growth rate. 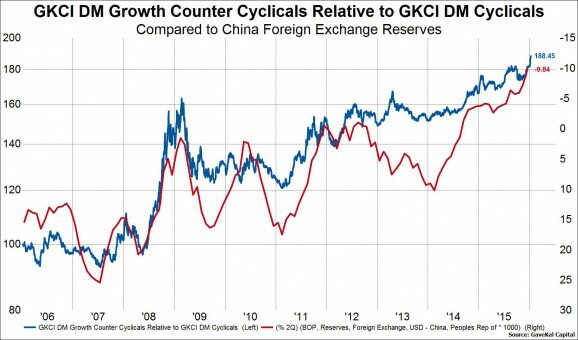 The yuan is likely to see new lows in 2016 as growth slows even further. 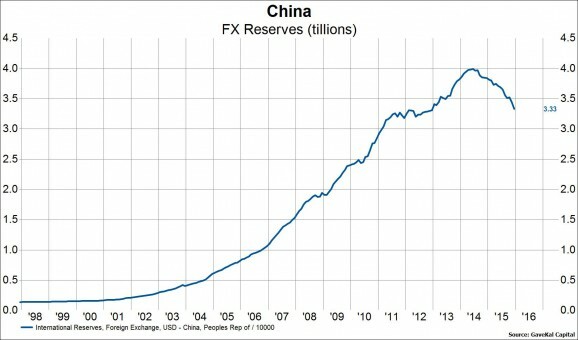 Foreign exchange reserves peaked back in mid-2014 and have since seen persistent declines as the Peoples Bank of China defends the exchange rate and “manages” a deliberate devaluation. And the outperformance of growth counter-cyclical stocks (health care and staples).